Haunted Museum is a light gun shooting game from Taito. The game has a large scale enclosed cabinet design with an 80" screen and a view port on the curtain. The game is based around the concept of objects in a museum coming to life, with players blasting through a range of varied environments and different enemies including medieval knights, sharks, and a giant boss made up of hundred of small toys. Players wield a gun controller that acts as a flashlight in the dark and a handgun with unlimited ammunition during battle. The English version of this game is known as Panic Museum. Haunted Museum is a light gun shooting game from Taito. 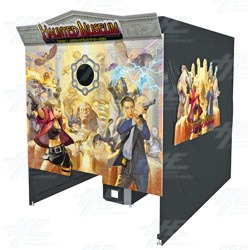 The game has a large scale enclosed cabinet design with an 80" screen and a view port on the curtain. The game is based around the concept of objects in a museum coming to life, with players blasting through a range of varied environments and different enemies including medieval knights, sharks, and a giant boss made up of hundred of small toys. Players wield a gun controller that acts as a flashlight in the dark and a handgun with unlimited ammunition during battle. The English version of this game is known as Panic Museum.